Toronto—April 4, 2014— Toronto – The Board of Directors for the Ontario Catholic School Trustees’ Association (OCSTA) is pleased to announce the appointment of Danielle Takacs as Director, Legislative and Political Affairs effective April 14, 2014. “The OCSTA hiring committee was very impressed with Ms. Takacs breadth of experience in the legislative and political arena. 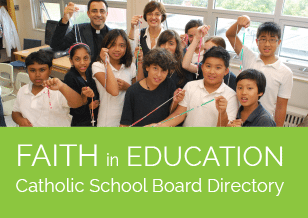 We are confident that through her leadership, she will advance our province-wide agenda in support of publicly funded Catholic education in Ontario,” says Marino Gazzola, OCSTA president. Danielle has over ten years’ experience in political affairs. She is currently vice-president at Pathway Group, a government relations firm in Toronto. In this role, she has established successful working relationships within the governing Liberal party, the province’s opposition parties and the provincial civil service. She has also worked for a variety of clients that include the Archdiocese of Toronto, Ontario’s Women’s Shelters, and the Onsite Waste Water Association. “I am honoured to join the OCSTA community. I will aim to not only bring strong relationships from the government side and solid legislative advice, but also a fresh, energized and passionate perspective for Catholic education to benefit our province’s children and families,” says Ms. Takacs. Ms. Takacs holds an M.A. in political science from the University of Guelph and is a graduate of Assumption College in Brantford. “Leading advocacy initiatives on behalf of Ontario’s Catholic school boards is the key work of OCSTA. That work will take on renewed energy and focus under Danielle’s leadership,” says Mr. Gazzola.